Leading up to the festivities of Christmas, Advent can bring many pressures to an already hectic time. Keeping Christ in Christmas is certainly our first objective but life’s realities must garner our attention as well. Balance needs to be found so that you approach the Season in a way that is right for you. As an individual, your life is unlike the life of any other. Your family responsibilities, job obligations, and the things that just happen – this all fits into the equation of what makes up the entire picture of your life. Sometimes stepping back and looking at the whole picture is a helpful means of finding balance for your reality. 1. Don’t feel inadequate because you’re not keeping up with all of the many opportunities to have the best Advent ever. You can’t do it all. You probably are not even able to fulfill your own personalized agenda each and every day. Be honest with yourself and grab onto the things you can do and prioritize. That way, your spiritual life will remain at the top but, your other duties will also stand a chance. 2. Instead savor Advent – a season purposely focused on waiting and preparation. Every day, try to find a quiet moment to allow God to fill the spaces in your heart that need comfort, courage, and grace. For a mom, that might only be available early in the morning, late at night, or while waiting in the car while performing mom’s taxi service. Yet, you can make it special nonetheless. Breathe deeply and invite Him in. 3. Don’t think you have to be Martha Stewart or recreate every ‘wow’ project on Pinterest, some years I make the most perfect cookies, from scratch. There are the cookies of my German heritage and there are the cookies that look picture perfect with colorful icing. I manage to get it all in because I feel inspired and because life has allowed it that year. Other years, it simply fails to happen. There might be too many choir and Christmas play practices. Or maybe I’ve chosen to sew a few gifts. Sometimes I simply feel uninspired. I’ve had to learn to just let life ebb and flow. The main thing is to make it to confession, prepare for His Coming, and to make sure others feel (and see) Christ’s love in me. 4. Instead simplify by choosing one or two things per day, so that you can enjoy Advent with your family. Maybe you are like me and want to be structured but your mind wanders restlessly between all of the objectives I’ve set up for myself. When that feeling threatens to steal my peace of mind, I go to the time-honored system of list making. The list begins with the most important objectives and dwindles down to the optional. If I set my mind to completing the items on my list, one at a time, it all of a sudden becomes doable. 5. 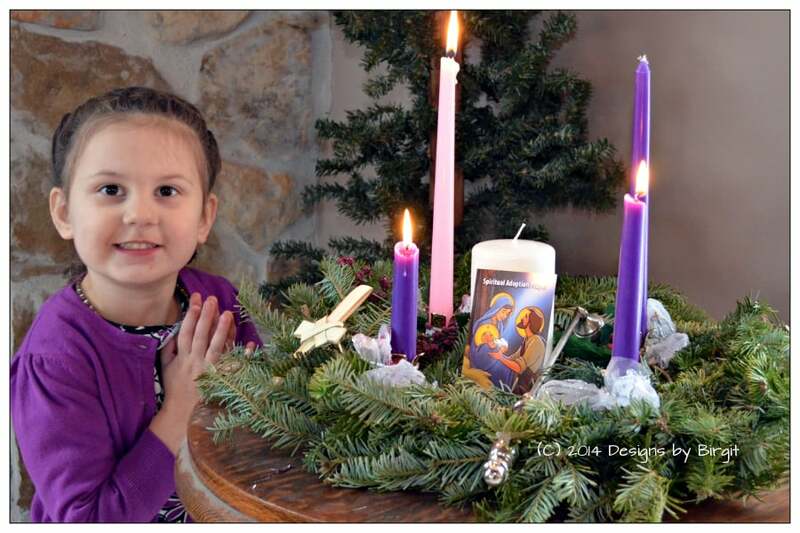 So what happens, after the second (or third) Sunday of Advent has come and gone? Don’t throw your hands up in despair because Advent has already begun and you’re feeling behind. Is it really too late? Not a chance. Remember, we serve a God of many chances. However many days remain, that’s how many opportunities you still have to ‘get with the program’. What’s your hold up? Start today! 6. Don’t over emphasize the material – whether it’s preparing a feast (or replicating a French pastry shop), gifting, or decor. Some years the financial picture is less promising than you would like. That’s the year that you give from the heart. Some of the most memorable gifts have been the ones that cost very little but hit just the right spot in the heart. Bags made for the girls out of left over fabric, a heritage cookbook, or a specially handcrafted booklet. These are actually the ones most cherished. 8. In the rushed and demanding days leading up to family gatherings, savor each aspect, make each prayer, book, project or gift sublimely important by pouring your love into it. Allow Jesus to sit at your side and offer these gifts to Him as well. When everything on your list is checked off, the last package is wrapped, and your special times with Jesus have strengthened your spirit, that’s when you’ll become most aware of the beauty of the Season. The glow of the faces around you as you attend Mass, the soothing nourishment your soul receives when receiving Him in the Eucharist, and the afterglow of the remembrance of a humble Child Who came to save us all – that will be your Gift. The hurry and worry will be washed away. Your preparation and readiness to greet Him will all fall into place and you’ll realize that we truly need the anticipatory time of Advent to fully celebrate Christmas.